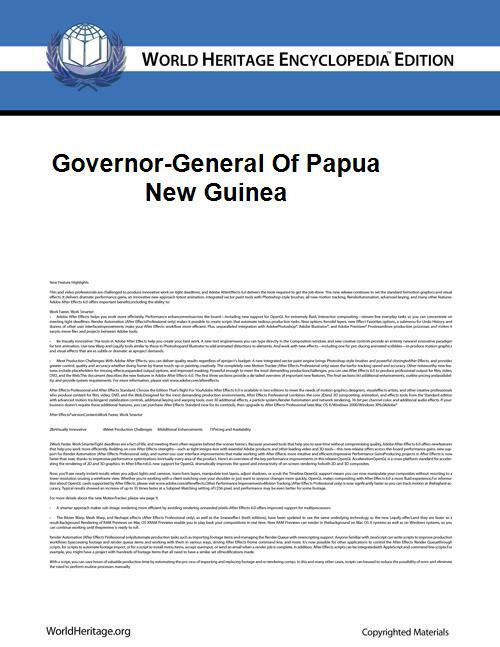 The Governor-General of Papua New Guinea is the viceregal representative of Queen Elizabeth II, known in Tok Pisin as 'Missis Kwin', Papua New Guinea's head of state, performing the duties of the Queen in her absence. The current Governor-General of Papua New Guinea is Sir Michael Ogio. 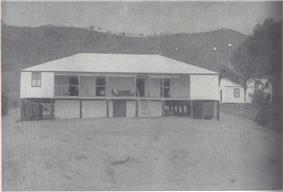 Government House Port Moresby early 1900s before Australia took administration of British New Guinea and changed its name to Papua. As in Australia, the vice-regal officer's title is spelled with a hyphen. Unlike other Commonwealth realms, the Governor-General of Papua New Guinea is nominated by the country's Parliament, rather than by its Prime Minister, as is the convention almost everywhere else. The appointment is made by the Head of State of Papua New Guinea, Queen Elizabeth II, following a simple majority vote of the National Parliament. For a second term, a two-thirds majority is required. No person may serve for more than two terms, a matter made formal relation in Papua New Guinea. Thus far all retired governor-generals have been knighted. If the office of Governor-General becomes vacant, the Speaker of the National Parliament becomes acting Governor-General until a new appointment is made. The Governor-General may be dismissed by either a decision of the National Executive Council or an absolute majority of the National Parliament. No Governor-General has been dismissed from office, although Sir Serei Eri resigned from office, due to his dismissal being instructed to the Queen by Prime Minister Rabbie Namaliu. Names in white indicate the Speaker acting as the Governor-General. 1 Sir John Guise 6 September 1975 – March 1, 1977 Queen Elizabeth II Resigned from office to contest election. 3 Sir Kingsford Dibela 1 March 1983 – 1 March 1989 Resigned from office. 4 Sir Ignatius Kilage 1 March 1989 – 31 December 1989 Died in office. 5 Sir Serei Eri 27 February 1990 – 4 October 1991 Resigned from office, due to dismissal instructed to the Queen by Prime Minister. 8 Sir Paulias Matane 29 June 2004 – 13 December 2010 Elected by Parliament 50 votes - 46 on May 27, 2004.